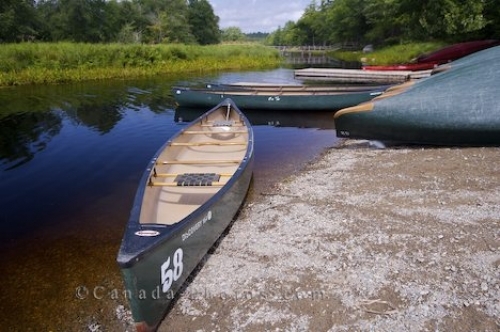 Canoe rentals for visitors to Kejimkujik National Park in Nova Scotia, Canada are available along the banks of the Mersey River. Tranquility, wilderness and lush greenery surrounds the scenic waterway of the Mersey River in Kejimkujik National Park in Nova Scotia, Canada. Visitors will find a clearing along the banks of the river where canoe rentals are available for those wanted to explore the Mersey River in depth. On your adventure along the Mersey River, keep watch for any signs of wildlife which may frequent the water such as deer, moose, hares, black bears, bobcats, foxes and porcupines. The rentals come equipped with oars and life jackets which are needed while on any waterway and the only accessories needed for a canoe trip in Kejimkujik National Park is a hat, sunscreen and any food or drink needed for the day. Canoes on the bank of the Mersey River in Kejimkujik National Park and National Historic Site of Canada, Kejimkujik Scenic Drive, Highway 8, Nova Scotia, Canada. Picture of rental canoes moored along the banks of the Mersey River in Kejimkujik National Park in Nova Scotia, Canada.